WE REALLY CARE ABOUT YOUR CRUISE!! We are a family owned cruise company that is extremely proud of our ship, crew and reputation. We own and operate one cruise ship only, 'Toronto's Signature Yacht', the MISS TORONTO. Myself or one of my two sons will be your Captain and we will be available to you at all times throughout your cruise. There will be no excuses, ever. The Miss Toroonto already comes nicely appointed with wood and brass. Most clients do not decorate. But if you wish to add some special touches we are ready and willing to help. You may decorate yourself or hiring an outside contractor. We are happy to help with both of these options. Here are some pictures that have been sent in from clients from time to time. There are lots of smiles and our crew will always go above and beyond the call of duty to ensure your cruise is a success. 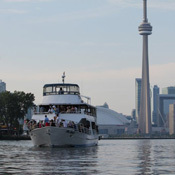 Our ship was built specifically for cruising the Toronto Harbour and Islands. Her shallow draft allows her access to all of the small channels and canals. Her large open bow with comfortable upolstered seating gives our guests room to stretch out and enjoy the beautiful scenery. She can be fully enclosed or wide open in a matter of minutes. She is a joy to be aboard in all types of weather. Our clients like to ask lots of questions and we enjoy answering each and every one of them. Here are some interesting facts about our guests and their favorites. We are so proud of our clients. Most come back time and time again or send us thier friends. Being an owner/operator I am able to establish a personal realationship with each and every client we service. I believe it is this personal touch that gives the guests a better time and added value.